Caroline Ayers teaches second grade in the same classroom where she attended second grade at Henry Elementary School in Ballwin, Missouri. A student’s grandmother presented Ayers with a quilt of her students’ handprints, above. 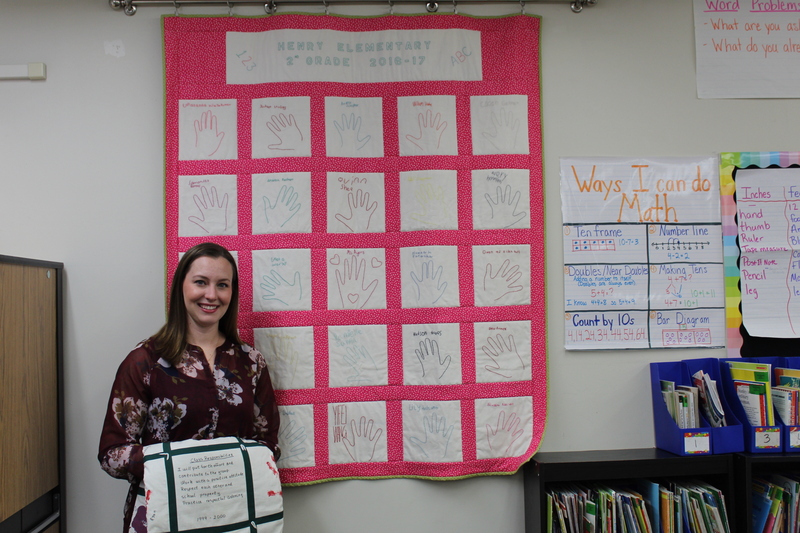 Ayers is holding a similar quilt from 1999, with handprints from Ayers and her classmates. The quilt also hangs in Ayers’ classroom. A busy second-grade teacher at Henry Elementary School in Ballwin, Missouri, Ayers manages to find time to serve on the Westminster Alumni Council and Facility Corporation Board for Kappa Alpha Theta. 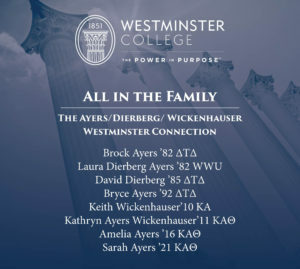 Ayers is acutely aware of Westminster’s unique reciprocal relationships: six other family members (see inset) graduated from the College, her youngest sister is a sophomore at Westminster, and her mother, Laura Dierberg Ayers, is a 1982 graduate of William Woods University. “Going to the President’s Dinner, Alumni Weekend, and other receptions or events are like holidays in our family,” jokes Ayers, who majored in Early Childhood and Elementary Education. A multitasking holiday that incorporates giving back to the College she loves while catching up with family seems perfectly logical for someone who is able to juggle more than 20 squirmy second graders every day. In addition to her daily responsibilities and Westminster commitments, Ayers also stays busy with her own studies and plans to graduate in May with a master’s degree in Education Administration from Lindenwood University in St. Charles, Missouri. Westminster recently caught up with Ayers to discuss her obvious commitment to education, memories of her time spent at the College, and how her Westminster education helped her find the power in her purpose. Do you enjoy what you do? I love what I do! I have students who are learning at a beginning first grade level all the way up to students on a middle school level, so teaching them where they are and trying to challenge them keeps me on my toes. Throughout the day, we also teach the students how to become leaders and productive citizens. Watching my students grow throughout the school year into capable, confident, curious, and caring individuals is very rewarding. What achievements are you most proud of? I am very proud that I was nominated for an Albert Award from Parkway Alumni Association this year, and I would say that my greatest success is helping my students become better learners and leaders. It is amazing to see how much they change and grow in just one school year. The other day I was standing in the hall, and all of the sudden there was a line of my kids from last year leaving the cafeteria and coming to give me a hug. Some people may think teachers are not very important, but hopefully I have made a positive impact in my students’ lives, and they pay it forward by making positive impacts in other lives, and they will grow up and do something amazing. What made you choose Westminster College? I loved the size of the school, the community that was created, the ability to be involved with different organizations, and so many other things. Westminster was the only college I applied to because I knew it was the only place that was the right fit for me. My sisters and I have all chosen different career paths. I always thought that was one of the many great things about Westminster — that I could do education, my sisters could do biology, psychology, national security, political science, and transnational studies — but we could also be a part of the same organizations like Kappa Alpha Theta, Students Ambassadors, Student Foundation, Blue Blazers, etc. Would you recommend Westminster to prospective college students? I would absolutely recommend Westminster to a prospective student. I think there are so many great opportunities at Westminster with not only education in your field, but in developing your leadership skills and connecting you with successful alums. It is really hard for me to put into words why Westminster is a great school. It is just a magical place. I have created many lifelong friendships from my time at Westminster, and those people are doing incredible things. How did Westminster help you find your purpose? The Education Department provided me with a great education and hands-on experience to become a teacher. I believe the liberal arts education taught me to think and helped me become an even better and well-rounded teacher. The small class sizes at Westminster meant there was a lot of personalized learning and support. I was able to work with peers on projects and presentations, helping me learn from others and improve certain skills. In addition, the ability to be a part of so many different organizations, and holding an executive officer position on many of them, helped me further my leadership skills. All of these Westminster features helped me define my goal of someday becoming an elementary school principal. I have no doubt that I would not be where I am today, or where I hope to be in the future, without my Westminster experience. What is your favorite book? Sisters First: Stories from Our Wild and Wonderful Life by Jenna Bush Hager and Barbara Pierce Bush is a great book. It gives you a different perspective on many events that have happened in America and also allows you get to know them better. Do you have a favorite TV show? Friends is my favorite show and is great to watch at any time.